(Ratcliff, 1985). The formation of melanin is catalysed by phenoloxidase-monophe-nyl-l-dopa: oxygen oxidoreductase (Soderhall & Cerenius, 1998). 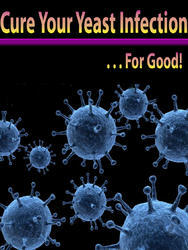 As melanin is highly toxic to microbes and the insect host, its overactivity could be potentially damaging to the host. Therefore, the serine protease cascade that initiates the ProPO-AS system is highly controlled by protease inhibitors to confine activity to the site of infection (Soderhall & Cerenius, 1998). There is evidence to suggest interaction between the insect haemolymph-clotting mechanism and the phenoloxi-dase system, with many of the same proteins being involved in both pathways (Li et al., 2002). 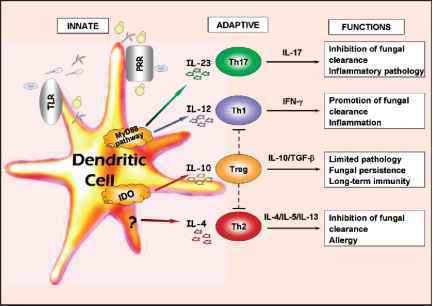 This study highlights the complexity and high level of interconnection between the different responses of the insect immune response. PRRs activate the compliment system in vertebrates and the proPO-AS system in insects. Many PRRs have been identified in insects; the peptidoglycan recognition protein (Yoshida et al., 1986; Mellroth et al., 2005), C-type lectins (Watanabe et al., 2006; Tanji et al., 2006; Ourth et al., 2005) and the 0-1,3 glucan-binding protein known to be involved in activation of the ProPO-AS pathway (Wang & Jiang, 2006; Lee et al., 2003). Mammalian TLRs are considered PRRs, as they recognise LPS and other microbial products. Many Toll-related genes exist in the Drosophila genome (Toll3-Toll8, 18-wheeler) (Leclerc & Reichhart, 2004). The involvement of Toll in the activation of the ProPO-AS would imply the dual production of AMPs and production of melanin. Metros et al. (2002) linked Toll activation and melanisation by revealing that Toll activation was dependent upon the removal of the Drosophila serine protease inhibitor Serpin27A. 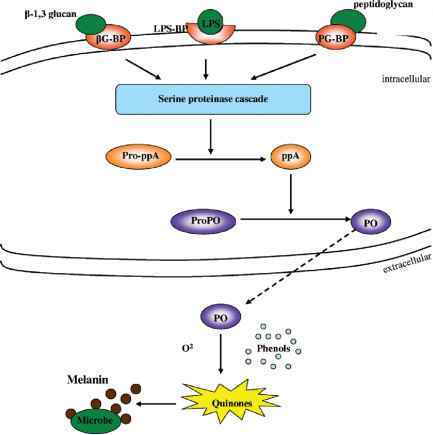 They also reported that microbial challenge induced removal of the serine protease inhibitor Serpin27A via Toll-dependent transcription of an immune reaction component and therefore activating the phenoloxidase cascade and melanisation. Insect ProPO has sequence similarity to the thiol-ester region of vertebrate complement proteins C3 and C4 (Nair et al., 2005), indicating a possible relationship between these proteins and perhaps the ProPO-AS in insects and the complement system of vertebrates.